CKMS 102.7 FM’s 2018 Ever After Podcast hits the MIXCLOUD.COM TOP 100 at number 35 !!!!! Humbled to say the least; OUR Latest CKMS PODCAST from Ever After Music Festival HITS THE MIXCLOUD.COM TOP 100 CHARTS AT 35 THIS WEEK!!!!! 102.7 FM Podcast with Cam Matthews on-site at Ever After Music Festival 2018 now sitting 35TH in the category of Bass Music! 67TH OVERALL in the dubstep charts! and… 68th OVERALL in the DNB charts of the Mixcloud.com TOP 100 RADIO SHOWS AND PODCASTS !!! A first to hold 3 different charts TOP 100!!! Help us try to hit number 1 ! Show your support by listening and likes on mix cloud.com ! Big-Ups to CKMS and Mano-A-Mano radio for the connect to the Ever After pass and wireless mic to do the recording! CKMS-FM Live on-site at Ever After Music Festival 2018 ! PODCAST NOW AVAILABLE !!! Ever After Music Festival 2018 ! Take a listen in with Cam Matthews and CKMS 102.7 FM Waterloo Live on-site at the Ever After Music Festival in Kitchener, Ontario! This podcast is available on Mixcloud.com, 102.7 CKMS-FM syndicated content and available for download on radiowaterloo.ca. It takes you through some of the recorded DJ sets at the festival by the artist performances and festival-goer interviews throughout the day one and two of the 3 day festival. Music clips and DJ sets featured in this years podcast include Camo & Krooked, Pendulum DJ set, Drezo, AC Slater and Illenium. Festival goer’s doing interviews from K-W locals to near places like Burlington, Toronto and Richmond Hills, ON; to far like Montreal, Quebec, Alberta, British Columbia, Buffalo N.Y. and Chicago, Illinois! Recorded takes from all including ravers, merchants, awareness outreach workers and bass music lovers of all kinds. Ever After – Every June! Starting-up another Thursday night with non-stop music and ‘Live’ shows on CKMS… Denim Entertainment Radio at 4 pm! #Denimradio ! Tune it and Lock us in from 4 – 6 pm. Great high-energy radio and house music for your drive home! Listen to the Dos Equis man and follow his words of wisdom! Tune in and don’t miss ‘Denim Entertainment Radio’ today on 100.3 Sound fm locally or live stream it from the link on the sound fm website (to your left! “Listen Live!”) Tune in DJ Denim, turn up the volume and of course… Stay Thirsty for some good music my friends. Denim Entertainment Radio! High energy radio broadcasting to the Waterloo region and world-wide every Thursday from 4 o’clock to 6 o’clock! Lock it in, 100.3!!! Up next on CKMS… Denim Entertainment Radio!!! Every Thursday from 4 – 6 pm. Up next on CKMS! Kickin’ off another ‘College Night’ Thursday on CKMS…. DENIM ENTERTAINMENT RADIO!!! 4 -6 pm. Episode 64 today is featuring the sounds of two great local DJ’s doing a split set! DJ’s, Oddie and Metas-One holding down the show today! 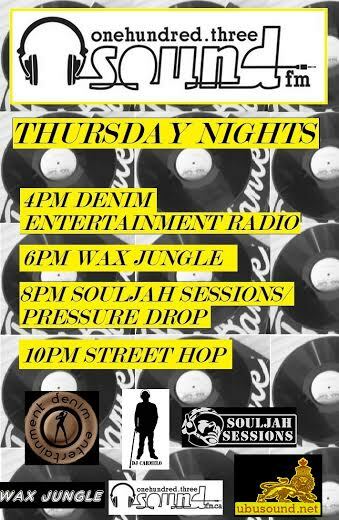 Denim Entertainment Radio up next! Every Thursday from 4 – 6 pm only on CKMS! ‘College Night’ Thursdays on CKMS! Tune-in locally NOW to 100.3 Sound fm for Denim Entertainment Radio and Denim Entertainment’s DJ Breakz of Dawn, as she Host episode 62 of #denimradio today from 4 – 6 pm! Don’t miss it! High energy pump-up music for your ride home home from work! Today featuring some deep house and Drum n’ Bass from the Breakz of Dawn! Tune Her in and Turn Her Up!!! Denim Entertainment Radio on CKMS every Thursday, 4 – 6 pm on CKMS 100.3 Sound fm. Just the start of College Night on CKMS! Great non-stop DJ sets All Night! Keep it Locked!!! Guest Interview today on Denim Entertainment Radio with upcoming EDM producer Marletron! with Host DJ Denim, on 100.3 Sound fm’s Denim Entertainment Radio, chatting about his debut single “World Is Yours”, his work with Miami Recording Artist Damiiana and his upcoming Europe Summer Tour. Tune in to CKMS 100.3 Sound FM today (March 20th) at 4:30 p.m. – ‘Denim Entertainment Radio’. Denim Entertainment Radio! Every Thursday ay 4 pm on CKMS! Denim Entertainment Radio on CKMS!!! Catch today’s live episode 57 of Denim Entertainment Radio at 4pm! Hosted by Sound fm’s DJ Denim and co-host Willy Nailer! On today’s episode, Denim will be spinnin’ up a set B2B (back-to-back) with the Rudegyal ‘Breakz of Dawn’ herself! She’s back again on Denim Entertainment Radio this afternoon! If you haven’t caught a set or the sounds of the ‘Breakz of Dawn’ before on Denim Entertainment Radio, live to air on CKMS or any of her past Live shows here in K-W (Elements, One-Eyed Jacks, etc.) then YOU do Not want to miss this Live show!!! DJ Denim and Rudegyal will be tearin’ up on the decks this afternoon at our uptown Waterloo studio! Also, catch some news on upcoming public local events with Denim Entertainment DJ’s Live, trending news in the house and DJ industry, catch our release of Denim Radio’s February ‘track of the month’! along with great Music and heavy Bass as always! All TODAY at 4 Pm! 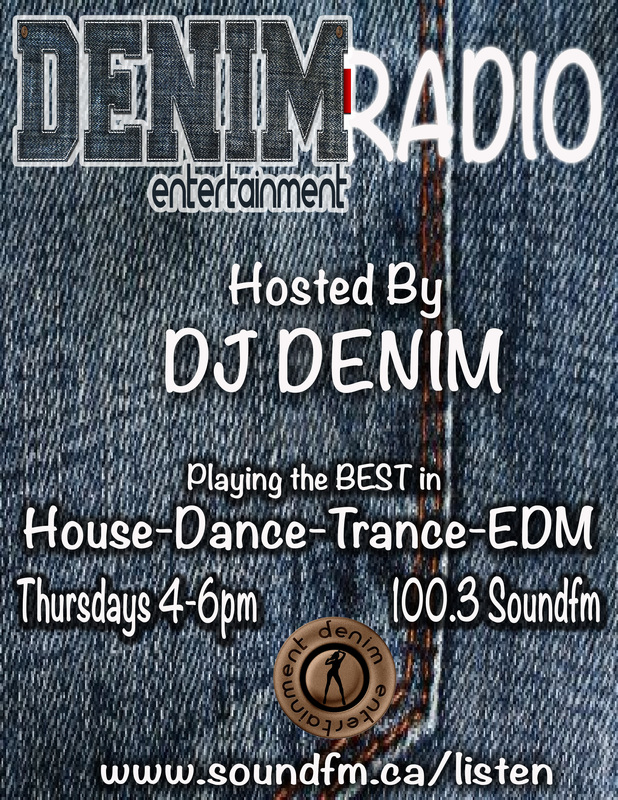 Only on Denim Entertainment Radio! Only on CKMS 100.3 Sound fm – Radio Waterloo Inc.